Firefighters have spent more than five hours at the scene of a large wildfire in the Highlands as 70 households in the area were left without power. The gorse fire ignited in the Tychat area near Temple Pier in Drumnadrochit shortly before noon, spreadingly rapidly through the surrounding woodland. Dozens of households and businesses in the area were left without power after the fire caused significant damage to an electrical pole. Scottish energy provider SSE confirmed two properties in the village looked set to remain without power until around 6pm as engineers continued to rectify the problem alongside the emergency services. Firefighters from Inverness and Fort Augustus remain at the scene smouldering the remains of the blaze. 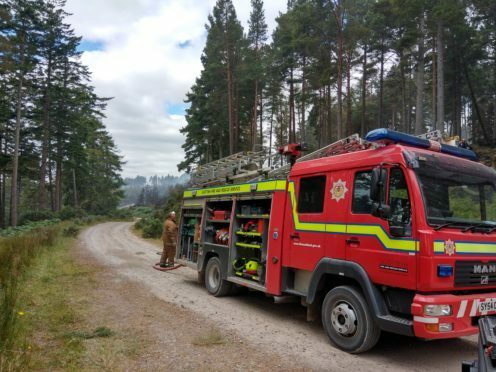 Two appliances from Inverness and one from Fort Augustus were dispatched to the scene after the fire service recieved the initial call at 11.56am. Three hose reel jets, knapsacks and two pieces of breathing apparatus were used to extinguish the fire. No-one was injured as a result of the blaze.